Luka Doncic has been likened to LeBron James and the duo's rookie numbers certainly show the Dallas Mavericks sensation and the Los Angeles Lakers superstar are comparable at this stage of the Slovenian's career. It was Dwyane Wade who said 19-year-old Doncic's passing ability was "LeBron James-like" after facing the Mavs with the Miami Heat last week. 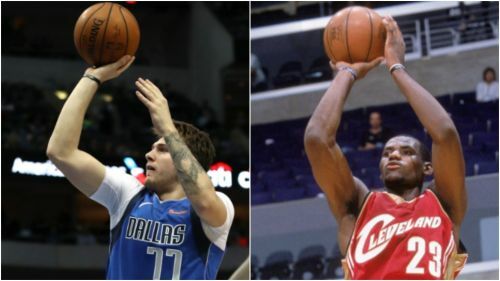 Doncic, the third overall pick in last year's draft, is the clear frontrunner for the Rookie of the Year award, a prize James took home in 2003-04 when he was a teenager playing for the Cleveland Cavaliers. Four-time MVP James has gone on to establish himself as one of the greatest to ever play the game, and the statistics from his rookie campaign are remarkably similar to Doncic's debut season in Dallas. With the help of Opta, we take a look at the numbers for Doncic in 2018-19 and James in 2003-04. James was one of 17 players to average at least 20 points per game and he finished his first season 13th, behind the likes of fellow rookie Carmelo Anthony (21) and Tracy McGrady, who led the entire NBA with 28. A sign of how the league has changed is evidenced by the fact that, at the All-Star break, there were 30 players averaging at least 20 points and one, James Harden (36.6), averaging more than 30. In his 55 games to date, Doncic is averaging 7.3 fewer minutes on court than James but is providing similar production. James may be taller and bigger than Doncic, but the Slovenian is proving adept when it comes to boards. The Mavs youngster ranks 36th in the league in rebounds, with James finishing his first campaign 58th in that category. Wade's suggestion the two are similar in the way they dish the ball around is backed up by the stats. Doncic is 21st in the NBA for assists per game, ahead of All-Stars like Stephen Curry and Paul George, though James was 13th overall in 2003-04. James attempted three more shots on average in his maiden term but Doncic is proving more efficient. The rise of three-point attempts is also reflected in the fact Doncic is making 2.4 per game from seven attempts, while James' rookie average was only 0.8 made from 2.7 attempted. Despite playing 24 fewer games than James did, Doncic already has more double-doubles than his counterpart managed. James failed to register a triple-double in his first campaign in Cleveland. Doncic became the second-youngster player to achieve the feat in January and has gone on to do it twice more. In fact, only six players have recorded more triple-doubles than Doncic in 2018-19 - one of whom is James.